US 101 begins in Olympia, Washington and heads north, going around the Olympic Penninsula to the Pacific Ocean. US 101 follows the Pacific coast south through Washington and then Oregon. The route continues to follow the Pacific coast through northernmost California before heading inland slightly, running to the east of CA 1. On its journey south, US 101 passes through San Francisco, San Luis Obispo, Santa Barbara, and eventually Los Angeles, where the route ends. Although US 101 has three digits, which would normally indicate that it was a branch of US 1, it behaves like a two-digit route, never coming anywhere near US 1, which follows the Atlantic coast. 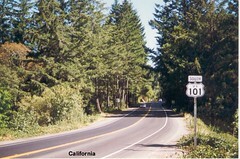 Since US 101 behaves like a two-digit route, we included it in our travels of one and two-digit routes. We traveled US 101 from end to end in August 1997 as part of our honeymoon. These photographs were taken along the way. View individual pictures of US 101 on Flickr. Learn about how the alignment of US 101 has changed since it was originally commissioned. Information about the ends of US 101 can be found here on the www.usends.com website.